1.1 This test method covers the determination of the resistance to abrasion of hosiery garments using the ILE SCR 800 8-Position Sock Tester1. 3.1.1 abrasion, n. — the wearing away of any part of a material by rubbing against another surface. 3.1.2 courses, n. — in knitted fabrics, the series of successive loops lying crosswise of a knitted fabric, that is, lying at right angles to a line passing through the open throat to the closed end of the loops. 3.2 NAHM5 Foot Forms — standard forms used in the hosiery industry for sizing garments. 4.1 By subjecting the garment to vertical rubbing against a specified abradant, the resistance to abrasion is measured. An endpoint is determined and discussed in Section 12. 6.1.1 Head Weights — 8 total, each weighing 22.66 + 0.1g (0.50 + 0.1 lb.). 6.3.2 25+ 2 mm. (1.0 + .0625 in.) in diameter. 6.4 China Marker —The China Marker is used to mark the abrasion testing area around the template. 6.5 Toothbrush —A medium bristle toothbrush is suggested for use of removing pills during abrasion testing. 6.6 Take one specimen per garment. 6.7 In the absence of applicable specifications, evaluate a minimum of three specimens. 7.1 After conditioning (see section 8), the test sample is obtained by placing the garment on a NAHM foot form. The form size used should represent the maximum size of the garment, as represented on the label. 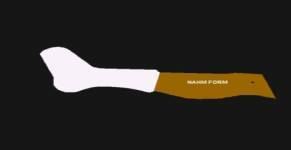 For example, a 9-11 stretch men’s sock should be tested on an 11.0 M (Male) NAHM foot form (see Figure Two). 7.2 After the garment is placed on the NAHM foot form, use the 82 + 2 mm (3.5 + .0625 in.) template is used to obtain a test specimen. 7.3 Mark the circular testing area by centering the template between the toe and heel cups of the bottom of the NAHM foot form. The template should be positioned in a manner that it covers both sides of the NAHM foot form and garment. 7.4 Remove the marked garment from the NAHM form. 7.5 Cut test specimens at least 35.0 + 5.0 mm (1.50 + 0.125 in.) in distance from the testing area of the garment. 8.1 Using AATCC Test Method 35, wash and dry test samples three (3) times. 8.2 Condition the specimens under standard conditions of 65 + 2% relative humidity and 2 + 10C (70+ 20F). 9.1.1 Place the 82 + 2 mm. (3.5 + .0625 in.) diameter abrasive on the sample holder. 9.1.2 Place the 25 + 2 mm. (1.0 + .0625 in.) diameter abrasive on the abrasion holder. 9.2.1 Turn the machine ON. 9.2.2 Set all cycle counters to zero. 10.1 Conduct the test in the standard atmosphere for testing textiles. 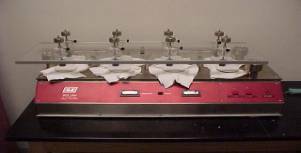 10.2 Place the test specimen on the sample holder with the wales of the garment running parallel to the abradant plate’s direction of travel. 10.3 Place the head weight on the motion plate. 10.5 As the ILE sock tester runs, observe the specimen(s). 10.6 Use a toothbrush to gently remove pills of matted fibers interfering with proper contact between the specimen and abradant during the test. 10.7 When the specimen abrades to the endpoint, stop the machine. 10.8 Record the number of cycles to reach the end point. 11.1. Failure—Abrade the specimen until all fibers in a section of the abrasion area are worn off. 11.1.2 Visual Rating —Abrade the specimen a specified number of cycles and evaluate visually for the effect of the abrasion on fabric structure. 12.1 State that the specimens were tested as directed in the specified test method. Describe the material or product sampled and the method of sampling used. 12.2.4 Any deviations from the standard test procedure. 13.1 Precision—the precision of this test method for measuring the abrasion resistance of hosiery by the ILE SCR 800 8-Position Sock Tester is being established. 13.2 Bias— No justifiable statement can be made on the bias for abrasion resistance of hosiery, since the value varies in fiber and style characteristics. 1 Commercially Available from Industrial Laboratory Equipment Co., Inc. PO Box 220245; Charlotte, NC 28222; 704/357/3930. 3 Annual AATCC Technical Manual. 4 TrizactTM is a trademark abradant of 3M Incorporated;3M Center, St. Paul, MN 55144-1000.